Darren Sammy is a St. Lucian cricketer who plays for West Indies. He was born on December 20th, 1983 in Micoud, St. Lucia. He is an all-rounder; he plays as a right-handed batsman and a right-arm medium-fast bowler. He is the first St. Lucian to play cricket at an international level. 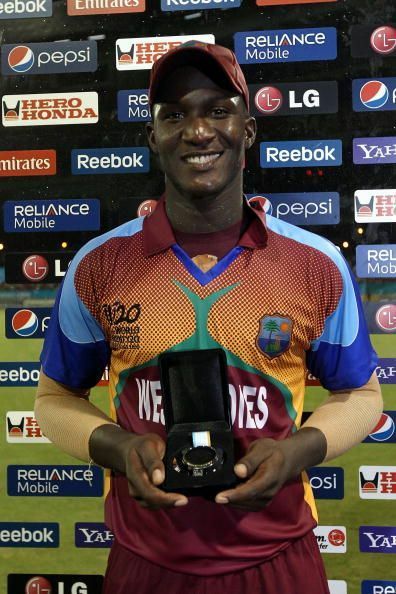 Darren Sammy started playing in official matches at the age of seventeen. He plays for West Indies national cricket team, Glamorgan, Hobart Hurricanes, Kings XI Punjab, Northern Windward Islands, Nottinghamshire, Peshawar Zalmi, Rajshahi Kings, Royal Challengers Bangalore, St. Lucia, St Lucia Zouks, Stanford Superstars, Sunrisers Hyderabad, University of West Indies Vice Chancellor's XI, Windward Islands and World-XI. Sammy’s Test debut was against England at Old Trafford on June 07, 2007, he made his ODI debut against New Zealand at The Rose Bowl on July 08, 2004 and his T20 debut against England at Kennington Oval on June 28, 2007. He played exceptionally well throughout all the seasons. He was well received by the public of West Indies, considering his incredible skills as a player and leader alike. Sammy suffered an injury a few months after he debuted in the international scene. He had to skip the first few matches but later joined his team. Sammy played for Windward Islands, Sunrisers Hyderabad, Hobart Hurricanes, Royal Challengers Bangalore, St Lucia Stars, Peshawar Zalmi, Rajshahi Kings, Hampshire and Kings XI Punjab. He still plays for St Lucia Stars, Peshawar Zalmi, Rajshahi Kings. Sammy became the captain of West Indies in 2011, replacing Chris Gayle. At the end of the year, he was named the captain across all formats of cricket. Throughout his time as captain, he improved a lot as a batsman. Sammy won 11 Man of the Match awards in international cricket and made five Test wicket hauls.